Beautifully lithographed unissued Certificate from the O.E. 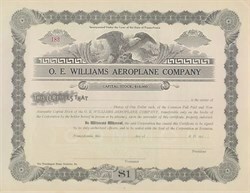 Williams Aeroplane Company printed in 1914. This historic document has an ornate border around it with a vignette of an eagle. It was printed by the Prendergasr Press, Scranton Pennsylvania. This early avaition item is over 96 years old. The company was founded by Osbert Edwin Williams.